I hesitated to write this article because for now the filibuster shutdown is over, but the political parties are growing farther apart not closer. This writer believes a well-established majority rule must be settled once and for all, or shutdowns are going to keep coming back again and again to no end. Folks, I am a lone writer with a one man’s opinion, period. Back before the welfare state beast got a grip on the throat of the USA following the “New Deal” programs no one gave a damn about a filibuster or a government shutdown. That was because almost no one was dependent of the federal government for hardly anything. Back before the comfort of air conditioning many people disliked Washington D.C. It was a high humidity hot sweaty place, and lawmakers could hardly wait to get out of there and back home. Times has certainly changed especially since 1980, now the USA has become a full-fledged super welfare state provider with millions upon millions of dependents solely depending on the federal government for survival. And there is no doubt in my mind that the liberals will sell the military and the whole country down the river in a New York minute to keep our welfare state beast well fed, period. Keeping something in the U.S. senate like the old arcane filibuster rule that can bring the whole federal government to a screeching halt, in this writer’s view is a great waste and growing danger. Sure, getting rid of the filibuster rule the minority in the senate will become just like the minority in the house with almost no power, but which is worse a stalled gridlock nation at a standstill, or a minority in the senate just like in the house with little or no power. With the filibuster rule gone there is no dictatorship here, it will still take both houses of congress and the president to make or change laws. Plus, the people can always vote the rascals out if one party gets too far out of line. I believe the senate majority be it democrat or republican must have the power to settle log jams without having a shutdown of the whole federal government, if the majority is wrong let the voters kick the rascals out. However, I can guarantee you if the coin was flipped and the Dem”s were in the majority in the senate they would not hesitate to use the nuclear option to have their way, so be it. Thank God, the shutdown has ended because at least half the nation’s workers lives from paycheck to paycheck including federal workers, and many may have faced bankruptcy due to a long shutdown. A LITTLE ABOUT THE WRITER: I, Freddie Lee Sirmans Senior is a writer with only a high school education, but with almost super natural wisdom, common sense, and sound judgment. And I have been writing for almost thirty years with over 37 books in print. Over all of these years I have stressed and constantly drum beat one thing well over a thousand times: That one thing is: only repealing the “Insane arch-evil 1938 socialist minimum wage law” can save the USA as a free nation, period. Only repealing this evil 1938 law can rein in rogue and out-of-control liberalism. Repealing this evil 1938 law will untie the disciplining power in the free market place USA economy, which will restore back our strong nuclear and extended family system, solve the USA immigration problem, and most other USA ills. 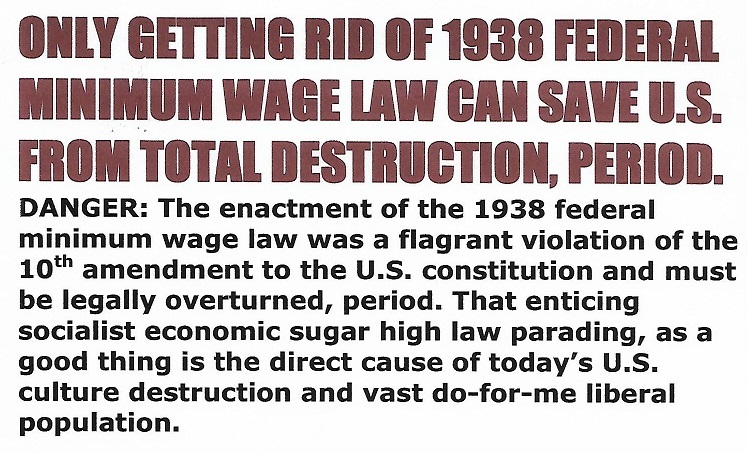 Repealing this evil 1938 law will give the USA back a true untied disciplinarian economy, which has never failed a nation. It won’t be pretty but the USA will survive with its individual freedom intact, otherwise our welfare state debt load will continue to grow heavier as liberalism continues to grow stronger until our USA economy totally collapses, period. FREDDIE LEE SIRMANS SENIOR’S LOG: 22 JANUARY 2018, 1559 HOURS. WHAT IS WRONG WITH THE U.S. SENATE WITH ALL OF THESE GRIDLOCK SHUTDOWNS? Folks, as a great self-made layman uneducated neurotic writer, let me give my analysis on why this entire senate gridlock shutdown is happening. To get at why the U.S. senate is having all of these gridlock shutdowns we need to understand how the founding fathers set up congress. They were men of great wisdom with great survival instincts, unlike a great many politicians of today. Congress was set up as two houses, the House of Representatives and the senate. The primary role of the House of Representatives was to represent the people. And its role has stayed basically the same even to this day. Whereas, the U.S. senate’s role has changed almost 180 degrees from what the founded fathers set it up to be. The primary role of the U.S. senate was set up to represent the states. And answer to the state governors and state legislatures. Each state governor was to appoint two senators to be approved by the state legislature for a term of six years. The senate was designed to move slow and act as baffle boards to keep emotionalism from sloshing all over the place. It was designed to provide enough time for cooled heads to prevail. However, there was a lot of frustration and bitterness buildup between state governors and state legislatures on who got to be appointed. So, the state governors and state legislatures took the course of least resistance and abandoned their duties by enacting the 17th amendment. Now, lets fast forward to the year of our Lord 2018: Today the U.S. senate is still bogged down with a lot of old arcane rules. However, as to the best of my knowledge, there is not a rule in the U.S. senate that can’t be changed with only a 51-majority vote including the filibuster rule. But, the reason the majority will almost never change a filibuster rule is because even though they may be in the majority at the present, after the next election the other side may have the majority. Folks, I did no research on this subject, I just wrote this article to the best of my knowledge. I hope it have been helpful to someone in someway, peace. FREDDIE LEE SIRMANS SR. LOG: 20 JANUARY 2018, 1309 HOURS. FREDDIE LEE SIRMANS SR. LOG: 17 JANUARY 2018, 1351 HOURS. IS TRUMP ALONE HOLDING BACK THE LIBERALISM GRIM REAPER??? Anytime a society or civilization reaches the final stage in moral and culture decline as in the USA today, one way or another over-powering liberalism rule will prevail. That is because moral decline, culture decline, and over-powering liberalism goes hand in hand as a reality, you can’t have one without the other. Sure, Trump has over-powering liberalism treed and at bay for the moment. But, liberalism in the USA is far too powerful and embedded to be held back for very long. Trump may be standing in the gap for now but he can only hold back the nutty shallow minded over-powering liberalism tide for so long then he will be swept away. Only, repealing the USA “Insane arch-evil 1938 socialist minimum wage law” can prevent over-powering liberalism from finally engulfing and destroying the USA culturally, morally, and economically into a total collapsing doomsday. Folks, I am only a lone self-made writer, love me or hate me, but I feel it is my destiny and duty to keep sounding the stress call alarm for my nation's survival, period. Glory be to God. I only write what I feel and believe. FREDDIE LEE SIRMANS SR. LOG: 05 JANUARY 2018, 0049 HOURS. UPDATED: 07 JANUARY 2018, 2148 HOURS. AGAIN UPDATED: 12 JANUARY 2018, 2030 HOURS. I have yet to see any individual, race, or nation blame its way to success and prosperity. It is far more important what one does for himself/herself than to keep blaming others for self-failure. Get a grip America (USA). I see all of these phony liberals patronizing African Americans with low expectation, while they make damn sure their young study hard and get the best education possible. Whereas, conservatives feel today every American is capable and no one should be pampered and excused. However, I forget who said: "A sucker is born everyday". In every election we all know in advance where 90 percent plus of the African American vote is going no matter the issue. I am so sick and tired of liberals totally ignoring self-responsibility and self-accountability, yet they clearly see racism hiding behind every tree. They even see any effort to enforce self-responsibility and self- accountability as some one who must be a racist. The answer to most human problems can be solved in three ways. The three ways are through love, discipline, or a balance between the two. The huge problem with the USA is a lack of societal discipline. Once the 1938 minimum wage law was enacted it killed the natural discipline in the USA free market place national economy. That allowed the USA to become a welfare state with the government taking over to a great extent the financial head of household role. But, unlike the original head of household provider, the government failed to instill in the very young the must proper norms and traditions that protects and safeguards every nation's culture. So, with each generation the USA culture and moral values are deteriorating more and more toward a course of least resistance liberal mode of thinking. Now, today in the USA we have a mass mostly liberal way of thinking news media. And they are under the false illusion that their way of thinking is reasonable and normal, when the sad truth actually is they are really shallow, naive, and with weak survival instincts. Only real discipline, hardship, and true survival struggle can open the liberal news media's eyes. So, with half of our welfare state nation blind from liberalism thanking including nearly all of the nations news media, people wake up, we have a case of the blind leading the blind for half the nation. Something as simple to solve as the homeless issue, yet all of these educated liberal do-gooders doesn’t have a clue on how to really get at the heart of the problem. Before 1938 the homeless was very few in number and never caused a major problem in USA cities. Before 1938 the homeless almost always had the nuclear and extended family umbrella support to fall back on if they so desired, but that was before uncle sugar seized and replaced the traditional responsible head of household provider role for the most part, especially among the poor. Now, for the most part liberal TV is instilling improper norms and blind traditions in our very young, its no wonder why western civilization is going to hell in a hand basket. So, the only real solution to solve the homeless problem is to repeal the 1938 minimum wage law, which will restore our former true free market economy. Everyone loves the boom cycle, but the bust cycle is a must to protect any nations culture and nuclear family foundation, however the wealthy and powerful thinks they can keep a phony perpetual motion economic engine running forever. I say non-sense, impossible, because nature will not allow anything to exist without a positive versus negative cycle, because everything is potential infinite and only balance allows the universe to exist. The bust cycle is nature's way of getting rid of waste and inefficiency to make room for new growth. Just like the life and death cycle. Once a genuine true free market place economy kicks in that will rebuild our strong nuclear and extended family system, then each member of the strong nuclear and extended family unit will be obligated to aid another member down on his/her luck providing the homeless are willing to help themselves, too. That is why it is a must to guard and keep a strong nuclear and extended family system. There has never been a society or civilization that existed past five or six generations without a strong nuclear and extended family system in place. As of today the USA and Western Europe may soon regress all the way back to the Stone Age unless their federal governments get rid of all minimum wage laws, period. As for local governments setting a minimum wage law I see no problem. I'm just serving another course of food for thought, y'all. With a strong nuclear and extended family system any nation can survive temporary after a totally economic collapse to regroup, but with a welfare state it will be total chaos after one day. So, I beg, please repeal the evil 1938 socialist minimum wage law before it is too late. Folks, I don't know why I have been writing basically the same thing for over twenty years. Maybe I will throw in a slight twist here and there, but still the focus is basically the same. I think it boils down to my first assault and siege on the "Insane arch-evil 1938 socialist minimum wage law"
I believe that evil 1938 socialist minimum wage law indirectly is the number one cause for the destruction of the USA nuclear and extended family system, period. Also, I believe unless this evil law is soon repealed the USA cannot be saved. Nothing else can really stop the liberals, and especially the shallow minded all-powerful liberal news media from finishing off the destruction of a free USA, period. Plus, we may have already passed the point of no return to save our great nation. Sure, I may stand almost alone in my raw crude way of thinking, but I truly believe I am a man on a destiny mission to help save my nation, even if I may be just a fantasizing dreamer.